A Slave in the Land of Liberty workshopped by the BBC Singers on 18/09/18 at a BASCA Workshop, Maida Vale Studios, London. VI Judas, Who Betrayed Him from my guitar suite Eyewitnesses of His Majesty performed by Mitsuo Nagata in Kyoto, Japan. Awarded Transmission Fund from Help Musician’s UK to help record solo viola piece The Testimony of John Paton. Awarded first prize for a selection of choral works in the 3rd International A.D. Kastalsky Contest of Choral Writing, with the possibility that one of being performed in Moscow October 2018. ConTempo String Quartet, Dublin, perform the string quartet Enturfment based on Seamus Heaney’s poem Digging. Irish Composer’s Collective: vocalists Michelle O’Rourke and Síobhra Quinlan perform my new piece Ezer based on the book of Ruth (Dublin). Accepted as a member of the Irish Composer’s Collective and an Associate Composer with the Contemporary Music Centre of Ireland. Selected as a finalist for the 3rd International Sergei Slonimsky Composition Competition, Moscow, Russia. My work ‘Sir, we wish to see Jesus’ to be performed by the GAMEnsemble. 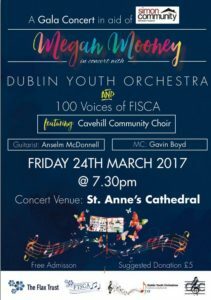 Concert programme. 22nd May 2018 Horn piece performed by Andrew Budden and filmed at St Michael’s, Manchester, as part of the Psappha Composing For Horn Scheme 2018. Play video. August 2018 Japanese premier of two of my guitar works will be performed by Rosetta Contemporary Ensemble. Eyewitness of His Majesty: – I Bartholomew, the Scholar, – VI Judas, who betrayed Him. March 2018 Joint 2nd place for the 3rd Peter Rosser Composition Award 2018. More details at Hard Rain Ensemble. March 2018 Sextet Two Baptisms in Solway Firth wins 1st prize and the Eric de Courcy Cup for the ‘IMRO Award – Chamber Ensemble’ composition at the 122nd Feis Ceoil, 2018. Adjudicator: Eric Sweeney, composer. 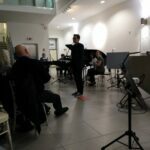 14th March 2018 Ficino Ensemble performed my commissioned work Dancing while others sleep in the Ulster Museum as part of Moving On Music‘s night music series. Follow the event on Facebook: Night Music Series. 6th March 2018 TheoArtistry CD Launch Concert – Hosted by St Salvator’s Chapel Choir, St Andrews. I am one of six composers to have produced new pieces under the guidance of Sir James MacMillan. 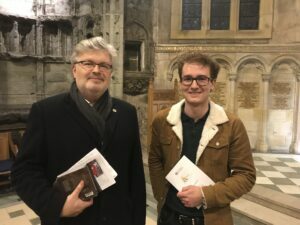 A CD featuring all six new pieces, along with music by MacMillan and other influential composers of sacred choral music was launched at this concert. 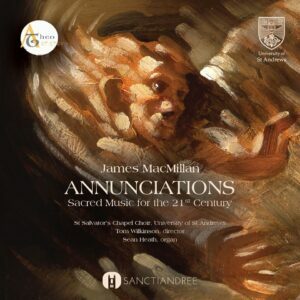 The CD features sacred music by Sir James MacMillan, his influences, contemporaries and six new generation composers mentored by him on the TheoArtistry Composers’ Scheme. 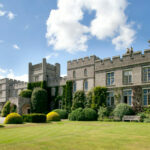 Read an article by George Corbett of the School of Divinity, University of St Andrews, on ‘TheoArtistry, and a Contemporary Perspective on Composing Sacred Choral Music‘ here in connection with this project. 14th February 2018 St Salvator’s Chapel Choir, St. Andrews, perform Hinneni as part of the Service of Readings and Music. February 2018 listed composer on Presto Classical. June 2017 Two Baptisms in Solway Firth premiered by The Assembly Project at the St. Magnus International Festival, Orkney, Scotland. 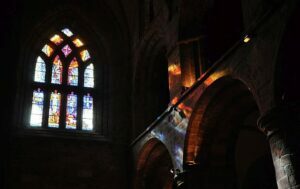 The St Magnus Composers’ Course 2017 is an intense experience for composers in the magical and inspiring surroundings of the Orkney Islands and is directed by composers Alasdair Nicolson and Sally Beamish. During the week, composers work with professional musicians performing at St Magnus International Festival and write a substantial work for The Assembly Project. 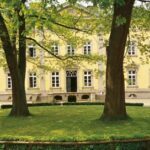 May 2017 A new piece written for the Marsyas Trio workshopped and recorded as part of the inaugural Peter Reynolds Composer Studio at the Vale of Glamorgan Festival Composer’s Programme under the artistic direction of festival founder and composer, John Metcalf, and senior lecturer in composition at Cardiff University School of Music, Robert Fokkens. April 2017 The Trial wins 1st prize for choral composition at the 121st Feis Ceoil, 2017. Adjudicator: Raymond Deane, composer. 24th March 2017 Flax Trust guitar performance. 9th March 2017. Harty Room, Music Building, Queen’s University, Belfast, premiere of three movements of the guitar suite Eyewitnesses of His Majesty by the composer. 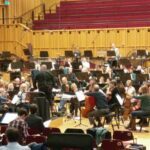 BBC National Orchestra of Wales rehearsing Movement IV of ‘The Pearl’. 21st February, 2017 My ensemble piece ‘The Great White Throne’ was played by Hard Rain Soloist Ensemble in the Ulster Museum. Anselm introducing ‘The Great White Throne’ to the audience at the Ulster Museum performance by Hard Rain Soloist Ensemble. 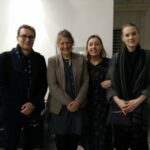 With (L-R) Shirley McWilliams, Fine Art tutor, Belfast School of Art, Rachel Rankin and Hannah Woodside, artists in residence with Belfast School of Art who created a video to accompany my piece. Jan./Feb. 2017 I was selected to take part in the Theoartistry project in St. Andrews, Scotland under the supervision of Sir James MacMillan. Attended 23rd West Dean International Classical Guitar Festival, Sussex August 2014. Attended 23rd International Guitar Symposium in Villigst and Iserlohn, Germany August 2014.